After finding the the pit bull, the horseback riders called Foxy Doxy Dachshund and Dog Rescue. 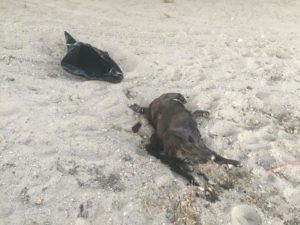 Stacey Wideman, the owner of the animal rescue organization, said when she arrived at the scene, she found the dog badly decomposed. The pit bull had been there for a few days, and it’s head had obviously been smashed, Wideman said. Wideman took the dog to El Camino Veterinary Hospital in Atascadero. There, veterinarians determined the pit bull suffered traumatic head injuries. Community members raised money to have the dog cremated and given a proper burial. The dog did not have a microchip, and Wideman’s team is still searching for the pit bull’s owner. A suspect could face animal cruelty charges. Anyone who has information about the case or a possible suspect is urged to call San Luis Obispo County Animal Control Services at 781-4400. Maybe this poor Boy just got hit by a car? I am an animal lover/protector/advocate too, but surprised this is newsworthy? When just a few years back there was a pit FULL of BUCKSHOT Shot point Blank! SO bad he had to be put down, and hmmmm, NO word on the news about that dog whom the OWNER, VET , Police and the HUMANE Society knew about!! And EVEN though there was a suspect, the Police did NOTHING! So why is this one Such a shocker, when there MAY have not even been any foul play?? I think IF it was a beloved pet, the owner would give the poor dog a proper burial if it died accidentally. There are good questions that come with the discovery and I hope someone has some answers. Could it be that someone’s beloved family pet died or was ran over by a car and this is how they were disposing of the body? Not everyone can afford a pet cremation. Sure, normal people wouldn’t dump their pet off in a trash bag, but are we living in a world of normal people these days? Not everything is a scandal…or is it?